I wanted to put some appropriately pretty scenery shot in the masthead of this blog after removing the photo of the Christmas tree, but frankly the scenery right now isn't too pretty. Like much of the rest of the country, we have no snow... so everything is looking rather brown and boring. So instead I put a photo of Lydia up there since, as all my regular readers know, I'm cuckoo about my dog. 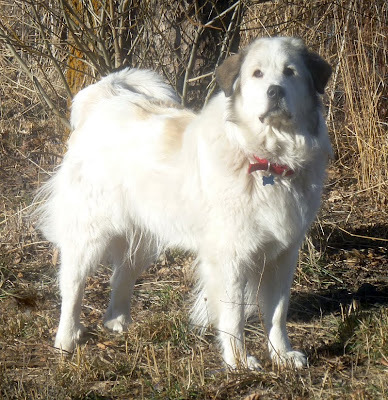 For new readers who aren't familiar with her, Lydia is a purebred Great Pyrenees who came to us through some tear-jerker circumstances. We had to put our beloved Pyrenees / Irish Wolfhound cross, Gypsy, down after only six years due to lymphoma. I was heartbroken. But thanks to the wonderful kindness of some folks at a place called Agape Ranch, Lydia came into our lives. She's sort of become the unofficial mascot of our farm at this point because so many readers see her all the time! They're a wonderful breed. Beautiful, intelligent, personable and all business when they're on duty ...gorgeous animals and Lydia is no exception. She is a beautiful dog! Can't wait until we can get another one. Just found your site a few days and have really been enjoying it, thank you and keep up the good work! Happy New Year! Love your dog. I finally had my Great Pyr moment. Driving into Caldwell ID, the other day. I passed by one of my neighbors harvested Alfalfa fields. Hundreds of sheep crossing the road. There was a tin roofed four wheel trailer in the field, with 3 sheperds and 4 Great Pyr's watching the flock. It was so great watching the dogs herd the flock. Too bad it was a day when I did not have my camera with me.